(June 17, 2016 – Toronto, Canada) – Leading producer Portfolio Entertainment is walking on the weird and wild side with the North American debut of its brand new kids animated series Freaktown, premiering on TELETOON on Monday, June 20th at 6:30 p.m. ET/PT. 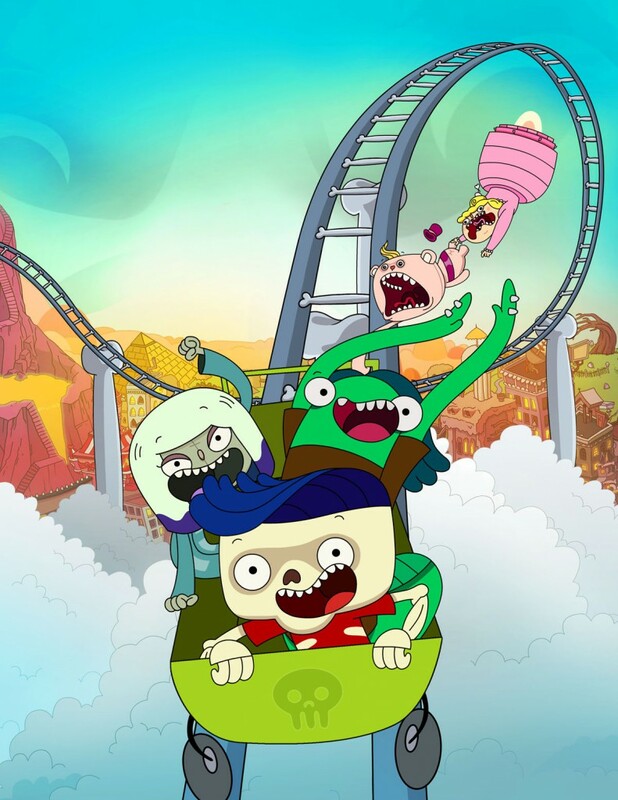 Produced by Portfolio Entertainment and created by Phil Ivanusic-Vallée and Peter Ricq (League of Super Evil), the 26-episode series follows the adventures of the Freaks of Freaktown, including best friends Ben Bones, a skeleton with soul, and Lenny, his mutant-mantis best bud. Together with their freaky friends, they aim to keep Freaktown a place where it’s cool to be a ghoul, even as Princess Boo-Boo of nearby Sweetlandia is intent on ‘sweetifying’ the town into a sparkly, cuddly cute-opia. Beginning July 4th, Freaktown will encore every week during the Camp TELETOON programming block on TELETOON, Fridays at 12 p.m. ET/PT and Sundays at 1 p.m. ET/PT and 6:30 p.m. ET/PT. Full episodes will be available on teletoon.com after their premiere. Freaktown’s launch on TELETOON is accompanied by new social media fan pages on Facebook, Instagram and YouTube featuring bonus content and posts using the #Freaktown hashtag. TELETOON also invites visitors to round up Freaktown’s Fluffies across their website to unlock a dedicated Freaktown web hub featuring exclusive bonus videos, sneak peeks of Freaktown, and an in-browser game, FREAKTOWN DEFENDERS. In the game, players control Ben, Lenny and Priscilla and defend Freaktown against the sweetifying forces of Princess Boo-Boo. If frilly frocks, tea parties and tiaras are not your thing and you’re more into the weird, wild and wacky, then you gotta hang with Ben Bones in Freaktown. It’s the last spot where it’s still cool to be a ghoul. You see, Freaktown is surrounded by Sweetlandia – an adorably horrible realm of pink, plushy perfection – a kingdom so sweet it will make you rainbow barf through your nose! Even worse, Sweetlandia is run by Princess Boo-Boo, who thinks Freaktown is a pimple in her perfect world. So she’s sent in her cushy cavalry, Lord Cuddles the Fluffy, to cute-ify the town! But no one’s going to candy-floss Freaktown on Ben’s watch! With best friends Lenny and Priscilla, Ben Bones unites Freaktown as they fight for the right to scare, spew and slobber! It’s non-stop fun in a never-ending battle of pink versus black, cute versus gross, and ponies versus piranhas. So come on down and have some fun in Freaktown! Portfolio Entertainment produces and distributes kids, factual and unscripted entertainment to television and digital media content providers worldwide. With two decades of industry experience, the company has a vibrant, creative culture and an entrepreneurial edge. Portfolio’s most notable projects include the celebrated The Cat in the Hat Knows A Lot About That! (PBS/Treehouse); DOKI (Discovery Kids), Freaktown, a new animated kids’ series set to launch on TELETOON in 2016; and the dogumentary, For the Love of Dog (Shaw). The company recently launched Portfolio Animation, a creative-driven animation studio staffed with top-tier talent and cutting-edge technology. For more information, please visit www.portfolioentertainment.com.